A helicopter drops water on a brush fire in Beverly Crest on Tuesday, June 12, 2018. A brush fire that broke out and threatened homes in the Beverly Crest area is 60 percent contained Wednesday after having scorched about 40 acres. The blaze was reported just before 2 p.m. Tuesday between Portola and Yoakum drives east of Benedict Canyon Drive, according to Margaret Stewart of the Los Angeles Fire Department. About 215 firefighters remained assigned to the location Wednesday. More than 250 battled the blaze at its height. The fire was sparked by a "weed wacker" being used by a contractor to clear brush in the rear of a home in the 9800 block of Portola Drive, Stewart said. Evacuations orders were lifted around 8 p.m. Tuesday for San Ysidro Drive between Milboro Place and Beeson Drive and the northern boundary of Highridge Drive down Summitridge Drive and continuing on San Ysidro Drive to Stan Place to the south. 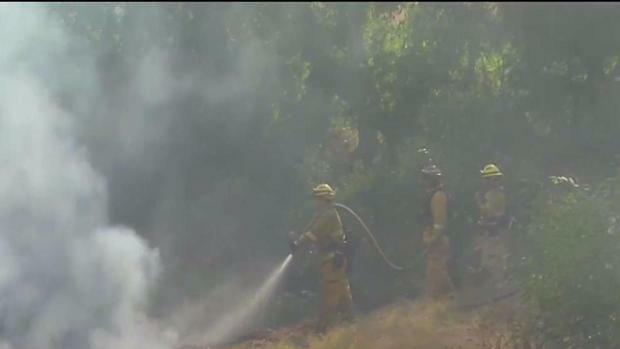 A brush fire sparked by a weed wacker prompted evacuations in a Beverly Hills neighborhood. Robert Kovacik reports for the NBC4 News on Tuesday, June 12, 2018. Around 85 homes were affected by evacuation orders or warnings, Stewart said. Two firefighters, both men, were taken to a hospital, one for heat exhaustion and the other for a minor burn injury, Stewart said. 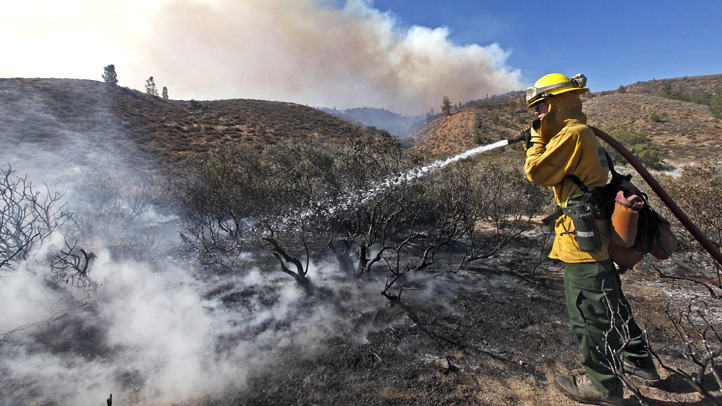 The fire burned uphill and in an easterly direction amid relatively light winds, Scott said. Homes to the north, south and east of the fire were threatened and crews worked to protect them from the flames, Stewart said. "This serves as a strong reminder to residents to only use licensed contractors who follow the safety requirements to include no metal blades and (Keep an) extinguishing agent at hand," Stewart said. "The exhaust manifolds (on weed trimmers and brush cutters) can get very hot and is the likely cause of the fire."